My current email address in acronis forums is obsolete and I can't change/edit it , I want to keep my user name. Can a moderator/forum admin do help me with that please ? 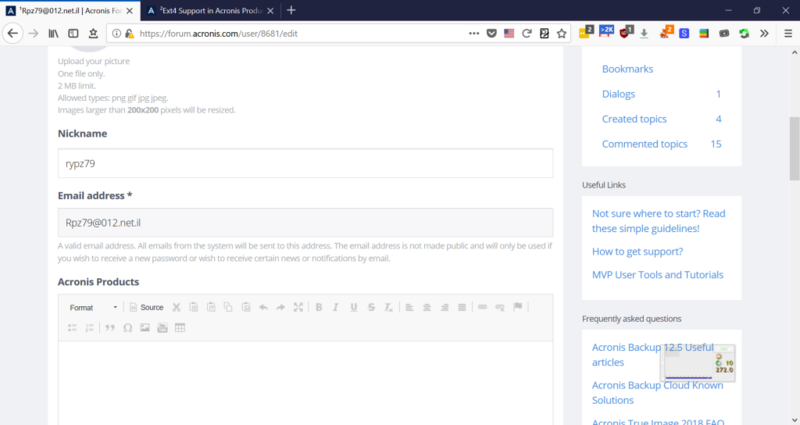 You log in to forum using your main Acronis account (one you created at https://account.acronis.com/#/auth/login), that's why it's not possible to change the login email. If you want to use another email, either change the registration email in your existing account (see 17998: How to сhange account e-mail) or register a new account with the new email-address, then log in to forum using credentials from your new account (new forum profile will be created in this case).